“inspiration, n.” OED Online. Oxford University Press, September 2014. Web. 13 October 2014. 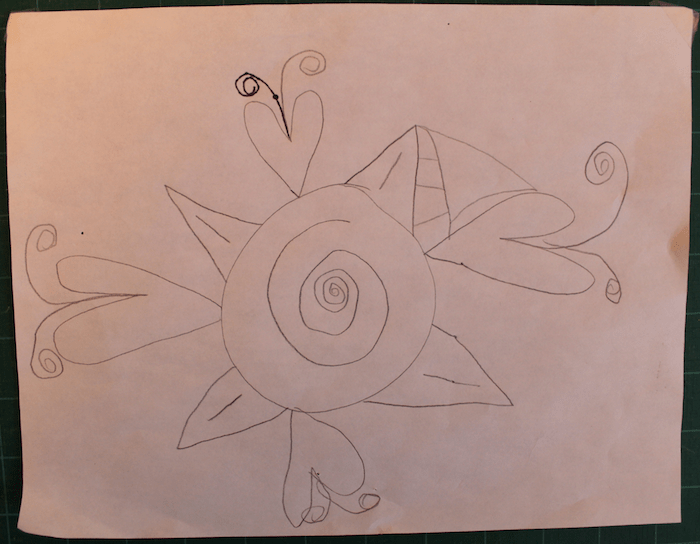 This sketch drawn by my 7 year old niece was the inspiration for my Whimsy quilt. I knew immediately that I would use it in a quilt. I loved the design, it was fun and playful. With a minimum of lines a flower was suggested by a spiral in a circle. Triangle shapes became leaves. I loved the curlicues sprouting from the hearts, they were so whimsical. The sketch suggested many design opportunities. 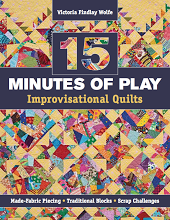 Victoria Findlay Wolfe’s book 15 Minutes of Play: Improvisational Quilts, gave me many ideas to use in making the quilt. I had a lot of scraps and this book gave me the inspiration to use them. Sorting through the scrap bins (yes plural! 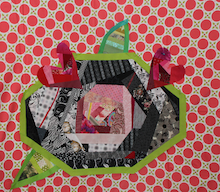 ), I separated my scraps into reds, greens, and black/white piles. Using Victoria’s instructions I began to create pieces of fabric in each colour way. 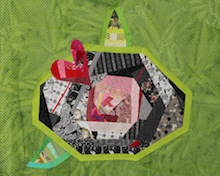 I enjoyed the process of playing with scraps, creating new and interesting pieces to work with. Once I had the centre portion completed, I auditioned fabric for the background. I had an idea of what fabric I wanted, but my first few choices didn’t really work. Some of the background fabrics were too close in colour to some of the elements and they disappeared into the background. Some fabrics overpowered the design. In the end I found a polka dot piece that seemed just right. It was colourful but with a white background, the centre portion stood out. I added more black and white pieces in each of the corners and bound it in black. 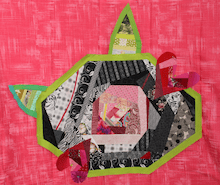 The entire quilt was free motion quilted. I really like this quilt, it is a different look for me. It was challenging to work outside of my comfort zone. The original sketch is still pinned to my design wall and inspiring me. 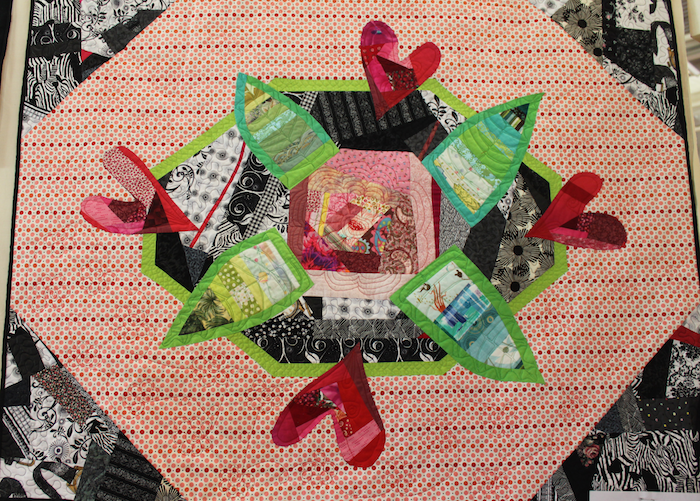 There are more ideas to extract from this sketch: more creativity, more quilts!